Home > NEWS > DORO Announce US Co-Headlining Tour With METAL CHURCH! The metal queen is back! Back in the USA! 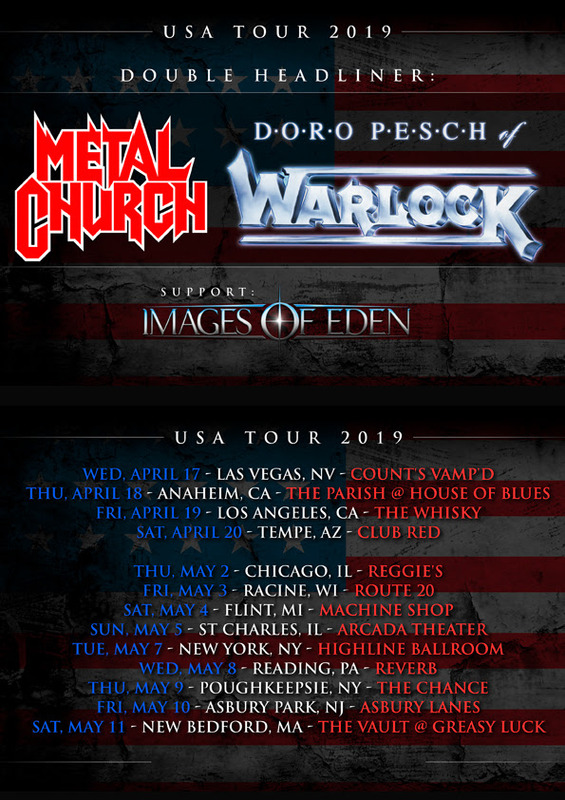 DORO Pesch of WARLOCK will tour the states in April & May 2019! The two leg tour will start on April 17 in Las Vegas, NV and conclude on May 11th in New Bedford, MA. Tickets for the dates are now on sale! DORO is currently in the states right now as she will be the laudatory for Lita Ford, who will be inducted to the ‘Hall Of Heavy Metal History“ in Anaheim, CA. An honor, that DORO herself received already last year at the world famous Wacken festival in Northern Germany in front of over 80,000 fans! West Coast metal veterans Metal Church will hit the road in support of their latest release “Damned IfYou Do” which is the bands 12th studio album and was released on December 7th, 2018 via Rat Pak Records (North America), Nuclear Blast (Europe) and KING Records (Japan). “Damned If You Do” landed at #34 on Billboard’s Top Current Albums and #09 on the Top Hard Rock Albums and is the follow up to their highly successful 2016 album “XI“, which saw the return of legendary front-man Mike Howe. This is DORO‘s 20th album – and it’s arriving just in time for her 35th live stage anniversary! And yet it’s not just these two great anniversaries that make Forever Warriors // Forever United a truly extraordinary album. It’s also not just the fact that the metal queen is releasing her very first double album. On Forever Warriors // Forever United, DORO delivers a musical firecracker with an unbelievable amount of hits. From stadium anthems to ballads, from heavy metal to classical – the queen of rock and metal proves beyond doubt on this double album that she rules all facets within the rock genre (and far beyond)! And: Forever Warriors // Forever United is also more than just a double album – it’s actually two new DORO albums in one! On Forever Warriors, DORO presents herself as a wild warrior. Listen to the tracks“Bastardos,” “Blood,” “Sweat And Rock’n’Roll,” the first single “All For Metal” as well as “If I Can’t Have You – No One Will,” the duet with AMON AMARTH bellower Johan Hegg. This song contains brute force that will hit you right in the face. You have never heard DORO like this before! Forever United captivates with the emotional side of DORO, which of course focuses on topics such as friendship, love and deep connections. Examples are the Lemmy anthem“Living Life To The Fullest,” “Heartbroken,” “Lift Me Up” and the brand new single ‘It Cuts So Deep,” with which DORO has succeeded in producing even more great songs! A hymn like “All We Are,” a German ballad like “Für Immer” and a former WARLOCKguitarist… with Forever Warriors, Forever United, DORO has a new mega album under her belt which shows the rock queen in all of her countless, wonderful, varied facets. This album is another milestone in DORO‘s great career.